When you're short, everything seems out of reach. With the Epica Folding Step Stool, however, your kids will be able to fold, unfold, and carry the stool around to wherever they need it without any struggle or constantly asking for help. Great for developing their independence. The 9 inch x 11 inch platform is generously sized to fit your entire foot without toes and heels hanging dangerously over the edges. The top surface is covered completely with non-slip textured dots to give your feet plenty of traction and stability, even if you have wet shoes or feet. Single-handedly handle any situation where you need an extra 9 inches of reach. Even if your other hand is full, you can unfold the step stool so it is safe to stand on. The 9 x 11 platform is solid and stable when unfolded - use it with confidence. When the step stool is folded flat, it is less than 2 inches wide. That means you can store it anywhere you might need use it without taking up a lot of space: the kitchen, the bathroom, the garage, the kids' rooms, the RV, and the SUV. 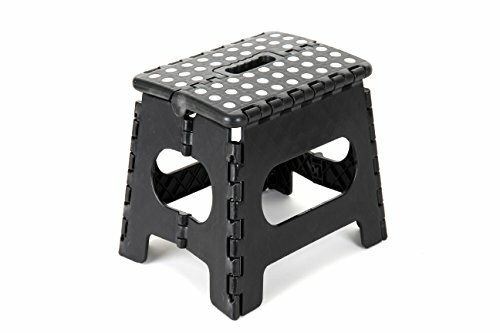 NOT ALL STOOLS ARE CREATED EQUAL: While they may look similar, the Epica Folding Step Stool is made from super strong, heavy grade material that can effortlessly hold up to 350 lbs. Cheaper imitations can crack under much less weight. EASY CARRY BUILT-IN HANDLE: The step stool's handle magically appears when the stool is folded flat. It's light enough that your children will be able to comfortably carry it around so they can place it where they need it. SPACE SAVING FOLD UP DESIGN: The step stool folds flat into one compact piece, 2 inches wide, so it can be stored anywhere you might need it: in the bathroom next to the sink, in the V or SUV, even in the kitchen cabinet under the sink. SAFETY CONSCIOUS NON-SLIP SURFACE: Everyone in your family can use the Epica Folding Step Stool with confidence because the top surface is covered with large, textured discs designed to increase traction. CONVENIENT ONE-HANDED OPERATION: The entire 9 inch x 11 inch platform folds up in a split second with only one hand - great for when you have your other hand full. The spacious plafits your entire foot so you aren't left teetering on the edge. If you have any questions about this product by Epica, contact us by completing and submitting the form below. If you are looking for a specif part number, please include it with your message.